SR Photofacial is a remarkable and gentle treatment for troublesome rosacea, facial vascular redness, large pores and sun damage as well as preventative and maintenance treatment for general signs of aging. SR Photofacial is a non-ablative therapies which means that it does not harm or remove the upper layer of the skin. Instead, it focuses on deeper skin layers to promote new collagen production and small vessels such as capillaries to improve skin tone, smoothness and appearance. How Does SR Photofacial Work? 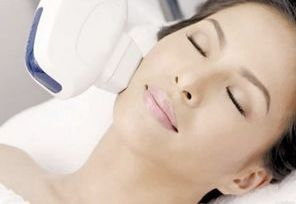 The SR Photofacial targets a broad spectrum of light to the lower layers of the epidermis causing the skin to produce new collagen and connective tissue, which supports the upper skin layer better and makes the skin surface smoother. SR Photofacial also targets vascular lesions and symptoms of rosacea and signs of photoaging. A special handpiece will be placed on your skin and will deliver light energy to the targeted area. What Does SR Photofacial Treat? Studies have shown that SR Photofacial improves vascular complexion problems such as vascular redness (telangiectasias) and rosacea by up to 80 to 90%. SR Photofacial also treats sun-damaged skin, large pores, mild hyperpigmentation. SR Photofacial is also used as a preventative measure against common signs of aging and a wide range of skin types can be treated. What Are SR Photofacial Treatments Like? SR Photofacial treatments usually take less than thirty minutes. Most patients will have a series of five to eight treatments; each treatment is about four weeks apart. SR Photofacials have no levels of discomfort so topical anesthesia is not required. A handpiece is placed over the treatment area and delivers the light energy which can feel like warming sensation against your skin. Some people describe the feeling of the light energy delivered to the skin like a warming sensation as if doing a hot stone massage. After the treatment discomfort is mild to nonexistent. Immediately after treatment the skin may feel warm and appear pink (easily covered with make up). Occasionally mild swelling or bruising can occur. Most patients can return to work immediately. Because SR Photofacials are nonablative treatments (nonharming), risk is greatly reduced. What should I expect from SR Photofacial Treatment? SR Photofacial is performed by a qualified therapist at a cost of just 45 euro per session. Treatments are recommended to be done between 3 to 5 months at a 4 week interval between each treatment. To apply for a consultation, kindly fill in the form below and we will contact you in return.